As the “megajournal” has become more familiar as a concept, the term itself has come to feel more nebulous and limiting. Digital technology has enabled a shift both in the scope of published research and also in who can access it. But publishing is not just about the technology, it is foremost about the academic communities it supports. Jason Hoyt reflects on the evolution of the megajournal and, as PeerJ turns five, announces a change to its editorial model that will incorporate the power of communities into the megajournal format. 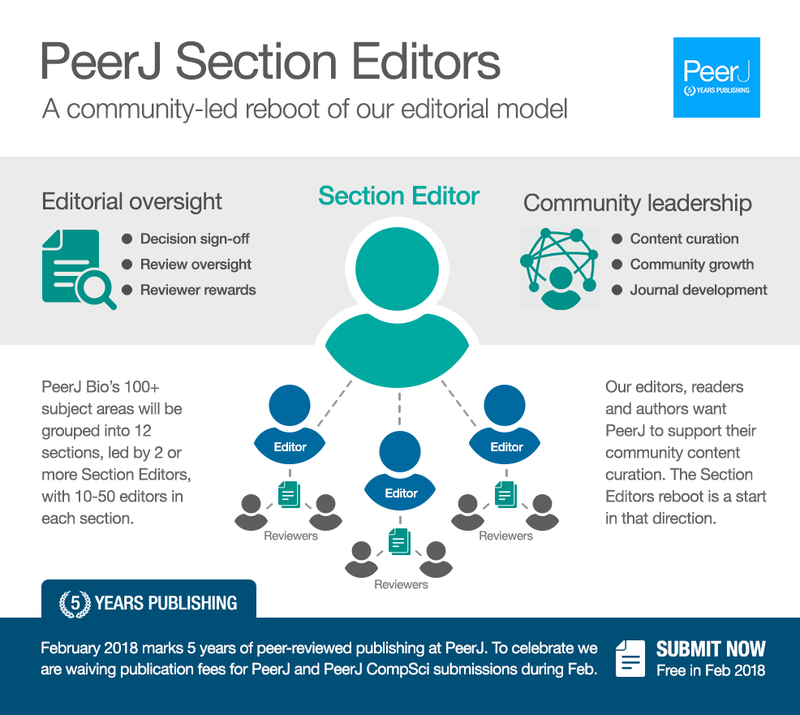 PeerJ will introduce section editors to take community leadership roles, working with existing academic editors to create greater consensus in publishing decisions and helping to curate and highlight important new research findings. Also, to celebrate this fifth anniversary, PeerJ and PeerJ Computer Science will waive the article processing charge (APC) for all manuscripts submitted in February. Five years ago we launched PeerJ, the open-access journal in biology, medicine and environmental sciences, to be a catalyst for change within the system of academic communication. As we have grown and as the open access community has grown over the years, it is worth taking a step back to see what has changed and what new innovations are on the horizon. One of our most noteworthy features five years ago was our broad scope. Now, the “megajournal” is a more familiar concept, but we’ve found the term to be both vague and a bit limiting. Megajournal is used to convey a shift with current publishing practices, both in the scope of what research is published but also in who can access that published research. Digital technology has enabled research to reach wider audiences, but publishing is not just about the technology, it is foremost about the academic communities it supports. For PeerJ, the megajournal format has always been about forming more inclusive publishing practices. High-quality science deserves to be reviewed and shared as quickly as possible. Over the last five years we’ve published over 4,000 articles in more than 150 subject areas. Science publishing can be done in an efficient, innovative, respectful, professional and, above all “open” manner. While a good editorial management system certainly helped, the success of the PeerJ megajournal was about creating conducive editorial conditions for articles to be judged according to scientific soundness and methodological rigour. Small technical changes and approaches can make a big difference. There are advantages to not requiring separate journals for each new subject area that appears, particularly at a time when scientific disciplines are merging and expanding. A megajournal with its online-only interface can contain limitless subject areas, removing print-era restrictions placed needlessly upon research communities. Furthermore, with the rise of academic search engines, researchers can easily navigate the breadth of research content through search and filters with relative ease. The availability of the latest research is growing. But there is still room for further improvements for how research is accessed. While being able to set filters and limit search results to specific areas is helpful, there’s a sense of coldness to it. Researchers need everything that is “publishable” available through search, but they also want to know what the research collective considers important. What powerful filtering tools and the world’s best search engines can’t replicate is a sense of community and human curation that is built-in to small subject-specific journals. Communities, online and in-person, are important as they bring a sense of shared values and norms. They bring familiarity. Today we’re announcing a change to the PeerJ editorial model that incorporates the power of communities into the megajournal format. We are introducing Section Editors to take community leadership roles by grouping our one hundred-plus subject areas into 12 distinct sections. The new Section Editor role is made up of experienced editors who are also full-time academics. Section Editors will have two primary responsibilities: first, the Section Editors will have “sign off” authority over Academic Editors within their section for reject and accept decisions. This is to create more consensus in a journal publishing thousands of articles per year. Secondly, Section Editors will help to curate and highlight important new research findings published within their sections. Restructuring our editorial model is a small technical change that we hope will have lasting impacts in how our authors, editors, reviewers and readers interact with scientific content. The power of the megajournal lies in its ability to improve the availability of high-quality research, and by empowering communities to shape these platforms we can also improve the accessibility. This is the next step for the megajournal and one we welcome. We are excited about what we have been able to achieve in five years, and we look forward to the next five! To celebrate, we are making it free to publish in PeerJ by waiving our article processing charge (APC) for all manuscripts submitted to PeerJ and PeerJ Computer Science in February. Researchers can submit articles here. More details on PeerJ Section Editors can be found in the announcement on the PeerJ blog. Jason Hoyt is co-founder and CEO of PeerJ, a new open access publisher funded by Tim O’Reilly, noted open source visionary, and co-founded alongside Peter Binfield, former publisher of the world’s largest academic journal, PLoS ONE. Jason holds a PhD in Genetics from Stanford University and previously served as VP of R&D at Mendeley before founding PeerJ.